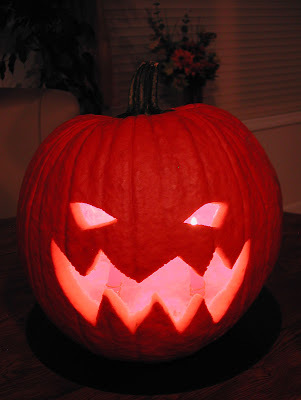 I know what your thinking, that is the first pumpkin you've ever carved? Well, as far as I can remember. It was long over do and I had fun. I also roasted the pumpkin seeds. I do know that we did roast the seeds at least once when I was a kid. My dad wanted my mom to make pumpkin pie with fresh pumpkin and that is why we had the seeds. My mom swears she would never do it again with all the mess and not only that but she says that the pie wasn't even good. Ever since, she has stuck to "One-Pie" canned pumpkin. And I have to say, her pie is excellent! Line a baking sheet with foil and spray with oil. Add the seeds to the baking sheet and spray lightly with oil. Sprinkle with salt and garlic powder. that's a fine looking pumpkin! I'm glad someone else likes pumpkin seeds. I haven't seen anyone else blog about them. Thanks Jen and Bambola. I guess it's not half bad for my first try! Emilie, Yeah except for you, I haven't either. 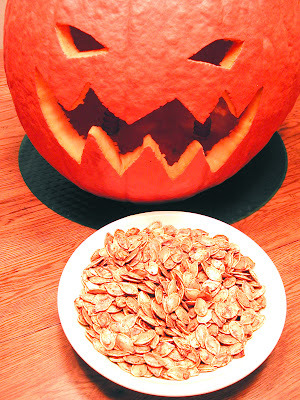 I love pumpkin seeds. I brought some in to work and everyone wanted more!